Alzheimer’s. It’s the only disease in the top ten causes of fatalities without a prevention, treatment or cure. In honor of November National Alzheimer’s Awareness Month, we had a chat with Berna Huebner, an Alzheimer’s advocate who has an uplifting and inspiring story about her mother who had Alzheimer’s. Berna faced her mother’s disease with courage and creativity. Over a decade after her mother’s death, Berna is still giving back to others affected by Alzheimer’s Disease. In 1995, Hilda Gorenstein (an artist known as Hilgos) was placed in a Chicago-area nursing home because of steadily worsening dementia, entered the great isolation that is often the world of Alzheimer’s, and stopped communicating. One day, her daughter, Berna, asked her mom, if she’d like to paint. Hilgos responded in a surprising way, answering: “Yes, I remember better when I paint.” Berna told her mother’s doctor, who suggested to try to have art students work with her mom. In the 1990s, this was a pioneering idea. Berna was amazed to see her mother’s steady improvement, both physical and verbal, through the use of the creative arts and how this reopened doors of communications, and in turn improved the quality of her mother’s life. After her mother’s death in 1998, Berna created a nonprofit organization, the Hilgos Foundation to advocate how the creative arts can help people who have Alzheimer’s to lead a better quality of life. She began to reach out to the artistic, scientific, academic and other communities to share her mother’s experience. MWG: Tell us about the documentary. Berna Huebner: My mother’s own words as she was living with Alzheimer’s became the catalyst for the film. 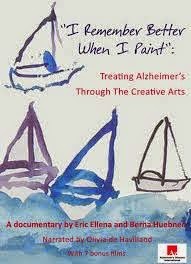 The documentary, co-directed by Eric Ellena and co-produced by French Connection Films, demonstrates how the creative arts can enhance the quality of life for people with Alzheimer’s. We’re very excited to share that the film has been selected to broadcast on PBS television stations nationwide during the month of November 2014. Narrated by Academy award-winning actress Olivia de Havilland, the documentary includes visits to a variety of care facilities in the US and Europe, as well as leading art museums to demonstrate how creative activities can reawaken a sense of identity, dignity and engagement among people with severe memory impairment. Leading doctors and neurologists explain how parts of the brain can be spared and discuss the life-enriching benefits of these creative approaches. Among these experts are Dr. Robert Butler, a founding director of the National Institutes on Aging (NIH) and a Pulitzer Prize-winning author, Dr. Samuel Gandy of Mt. Sinai School of Medicine, Dr. Robert Green of Brigham and Women’s Hospital and Harvard Medical School and Dr. Robert Stern, Professor of Neurology at Boston University. Inspiring personal stories highlight the transformative impact of art and other creative therapies and how they are changing the way we look at Alzheimer’s. Among those who are featured are Yasmin Aga Khan, president of Alzheimer’s Disease International and daughter of Rita Hayworth, who had Alzheimer’s. MWG: What are your hopes for changing how Alzheimer’s is treated? BH: The transformative power of art is still inadequately understood by those afflicted with Alzheimer’s and other forms of memory loss, their families, their caregivers, and the wider medical community. There is still much to be done to educate and advocate for this approach. MWG: Speaking of Twitter, we understand that social media has helped raise awareness and that your efforts have been nominated for an award. Tell us a bit more. BH: Social media, in particular Twitter, has been instrumental in helping to raise awareness about Alzheimer’s and how the creative arts can help. There is an amazing caregiving community on Twitter who support each other. We are dedicated to helping the community connect and share. Since 2011 we co-host a weekly dementia caregiver discussion called #AlzChat. We were humbled to learn that our @irememberbetter Twitter has recently been nominated for a WEGO Health Activist Award. MWG: Tell us more about the Hilgos Foundation. BH :The initial mission of the Hilgos Foundation was to raise scholarships for art students from the Chicago area to work with people who have memory impairment, although it has since come to encompass an international public education role as this disease becomes ever growing worldwide. Students in the Hilgos project have to date served hundreds of people. In addition to co-producing the documentary we have also published a book “I Remember Better When I Paint: Open Doors, Making Connections” which describes how people affected with dementia can be reconnected and how communications channels can be reopened through the creative arts. Berna G. Huebner is the founder of the Hilgos Foundation in Chicago, Illinois which supports and encourages the ongoing process of artistic creation with people who have different forms of dementia including Alzheimer’s. She is the co-director of I Remember Better When I Paint, an international documentary film which examines the positive impact of art on people with Alzheimer’s and shows how the creative arts can help Alzheimer's patients re-engage in life. Huebner served on the Boston University School of Medicine Alzheimer’s Board and is Director of the Center for the Study of International Communications in Paris, France. She is the former Research Director for Nelson Rockefeller when he was Governor of New York and then Vice President.